This is the multi-award winning tanning mousse from the tanning experts, St Tropez. By far our best selling self tanner, this is a great place to start if you’re new to self tanning. Likewise, experienced self tanners keep coming back for more of the beautiful, natural glow. 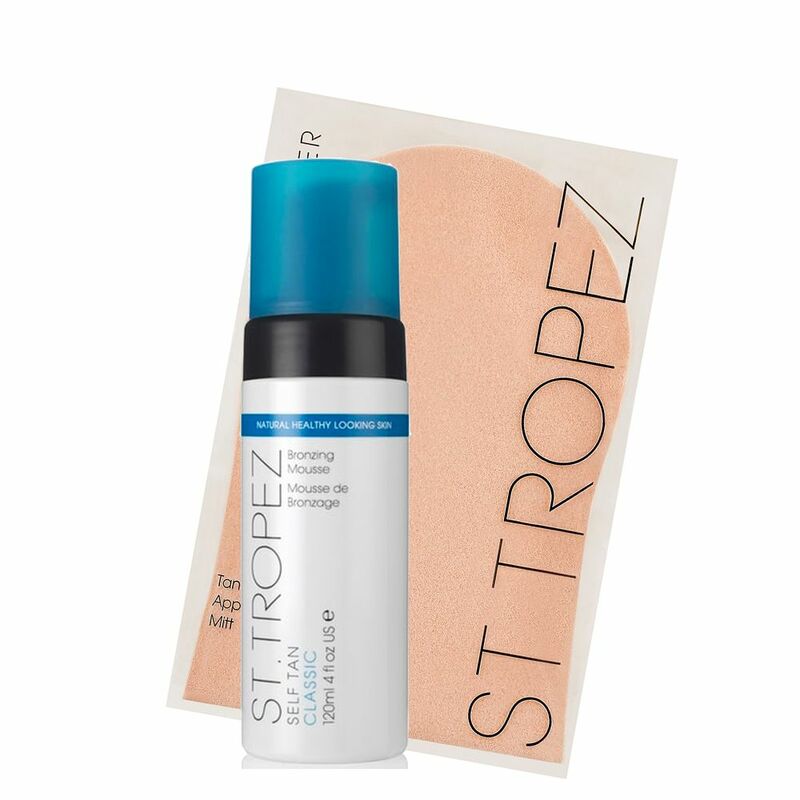 St Tropez Bronzing Mousse is a super-lightweight, easy-to-apply, velvety mousse that delivers an ultra-even all-over tan you’ve always wanted. Simply sweep on with an Applicator Mitt for a beautiful even tan. This is the multi-award winning tanning mousse from the tanning experts, St Tropez. By far our best selling self tanner, this is a great place to start if you're new to self tanning. Likewise, experienced self tanners keep coming back for more of the beautiful, natural glow. A soft, spongy Mitt that helps evenly distribute tanning mousse, gel or lotion onto the skin for streak-free results. I'm naturally very pale, and it's been hard getting tan, sun or no sun. I used to tan in tanning beds and outdoors, I loved the colour I got but was very worried about sun cancer and aging skin. So I started experimenting with many different sunless tanners, prices ranging from $5 to $60. I was disappointed with most, either they left me looking very orange or yellow and/or very streaky. I finally decided to order the St. Tropez bronzing mousse after hearing great things about it. It really does live up to the hype in my opinion; it dries quickly, gives instant color, and after showering it off the next day it looks very natural. The color didn't turn out as deep as I expected, but it was still a nice golden color and I'm sure with a second application the day after it would turn out even darker, which I have yet to try. The scent is nice, I still get the sunless tan smell the next day but it isn't as bad as some other brands I've tried. It does stain palms, so I use cheap latex gloves to apply the tanner, then use a tiny bit on the tops of my hands. The price is somewhat high, but honestly if the bronzing mousse was $100 I would still buy it so I think it's completely worth every penny. It lasts me a while if I use it 1-2 times a week. I hope they never stop making this product, and I definitely recommend it to anyone wanting natural color. This is the best and easiest self tanner I have found. You do need the mitt so you can apply even coverage. Looks very natural not streaky at all. I have tried many fake tans and this is the best by far- you can do your whole body in 10 mins, it dries straight away and doesn't streak at all! Also, if you accidently get wet in the rain whilst it is still developing, it doesn't affect the tan when its been washed off. A small one lasts me a month- I usually use it once a week- fantastic value for money! Absolutley FANTASTIC needed a quick tan at the last minute and it worked wonders. Its not even orange its actually brown which makes a difference from all these other products! Will be buying some more when I run out! Our best-selling product is perfect for anyone looking to get a natural-looking, streak-free golden tan that dries in an instant. Whether you’re a first-time tanner or a total pro, our tinted formula will ensure you know where to apply your tan for a perfect application, every time. Infused with conditioning aloe vera and long-lasting colour, our innovative Aromaguard fragrance technology eliminates the tell-tale self tan aroma by a minimum of 70% and instead gives a beautiful subtle, yet refreshing fragrance. Never orange, St Tropez Tan always gives a beautiful, golden colour. Exfoliate with St. Tropez Body Polish before moisturising dry areas thoroughly with St. Tropez Body Moisturiser (elbows, knees, ankles and feet). Help protect eyebrows and hairline with a little extra moisturiser. Using an Applicator Mitt, pump the Mousse into your Mitt, and apply with long, even sweeps from toes to top. Make sure you’re well covered as it’s only missed areas that can look patchy. Once you’ve got even coverage wait for 60 seconds before getting dressed. Try not to get wet, or sweat, for at least six hours. Finally, shower off to reveal a perfectly golden, natural looking tan.